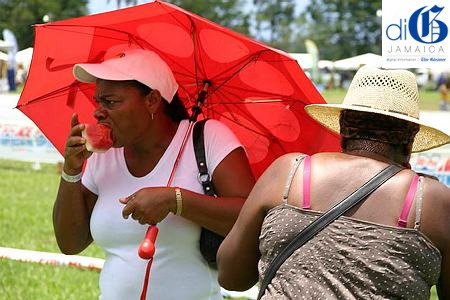 Several countries around the world are currently experiencing heat waves, and although we don’t have one in Jamaica, it’s certainly roasting outside. To make things worst, we’re currently in the midst of a severe water crisis, with many catchment areas containing more dust than H2O. And there’s no rain on the horizon. Invest in good fans or an energy-efficient AC unit – No explanations necessary. Get as much AC time as possible – If you work in an office with AC, good on you! If not, or if it’s the weekend, find any excuse to pop into air conditioned spaces. Make your own AC – Make a DIY air conditioner by positioning a shallow pan or bowl full of ice in front of your fan. The breeze will pick up cold water from the ice’s surface as it melts and create a cooling mist. Wet sheet = cool room – Cool down your whole room by hanging a wet sheet in front of an open window. Stay hydrated – There is an ongoing water crisis in the country, but it is vital to take in liquids since you will be sweating more than usual. At the same time, avoid alcoholic beverages and drinks containing caffeine, as both of these substances can act as diuretics and promote dehydration. Eat smaller meals – Every time you eat, you need metabolic heat your body to break down what you consume, so it follows that larger meals generate more body heat. Avoid foods that are high in protein, which increase metabolic heat. Take a warm shower – Seriously. It’s tempting to shower in ice-cold water when the temperature rises, but that actually causes your body to generate more heat in order to compensate for the heat lost in the shower. Take lukewarm showers instead, especially before bedtime. Drink warm beverages and eat spicy food – Again, seriously. Warm beverages and spicy food will raise your body temperature, causing you to sweat, which cools you down as the moisture evaporates. Stay low – Warm air rises, so if you live in a multi-level house, it’s best to avoid upstairs during the hottest hours of the day. When it comes to clothing, keep it light – Light-coloured cotton clothes are best. Synthetic fibres trap heat, but cotton absorbs perspiration and its evaporation causes you to feel cooler. Light colours also reflect the sun’s radiation. Same goes for your sheets! Lotions are not your friend – You don’t want to be ashy with dry skin all summer, but lotion can actually make you feel sweatier. You can use aloe vera gels or aloe-based after-sun products instead. Leave your windows and doors open as much as possible – Although there are valid safety concerns, exercise this option if your place is grilled. Adjust your drapes – If you have dark, heavy fabric curtains, keep those open to prevent keeping the heat trapped in the room. If you have light-coloured, lightweight fabric curtains, you can keep those drawn as they reflect radiation from the sun. Cooling foods are necessary – We’re talking the natural stuff, like watermelons, apples, cucumbers, lettuce and other leafy greens. Treats like ice cream, frozen yogurt and shaved ice are great also. Find any available body of water to make a splash – Take a beach or river trip. Spend time in the pool. Don’t forget the sunscreen! Be a ‘dry land tourist’ – There’s no rain in the forecast right now, but break out the umbrellas anyway to shield yourself from the sun. Avoid black or dark umbrellas. You should also wear a wide-brimmed hat or cap. Ice your pulse points – For an instant cool-down, apply ice packs or cold compresses to your wrists, neck, elbows, groin, ankles, and behind the knees. Get misty – Put a spray bottle in the fridge and use the cool water to mist your face and chest. Towel off – Wet towels or washcloths and place them at your neck, shoulders or on your head. Dunk it – Keep a basin of cool water handy. Use it to soak your feet in the day and stick your feet into before heading to bed at night. Since conservation is the name of the game, you don’t have to change the water. Make sure your feet are clean, though! Go unplugged – Don’t panic! We don’t mean your fans. Unplug gadgets and any electronic items not in use as they give off heat. And while you’re at it, turn off all the lights inside the house at night, especially if they’re incandescent bulbs. Sleep on the floor – You slip on your house slippers every time you leave the bed at night because the floor is cold, right? Get some sheets or a minimalist straw or bamboo mat and hit the floor. Remember: The elderly, infants, and persons with chronic illnesses need special care as they may dehydrate easily and be more susceptible to heat-related illnesses.